The Maybelline Express Remover is a potted nail polish remover. As you can see from the photos above, the pot contains a piece of sponge that's been soaked in the remover solution. The sponge has a circle cut out in the middle that's the perfect size for a finger. 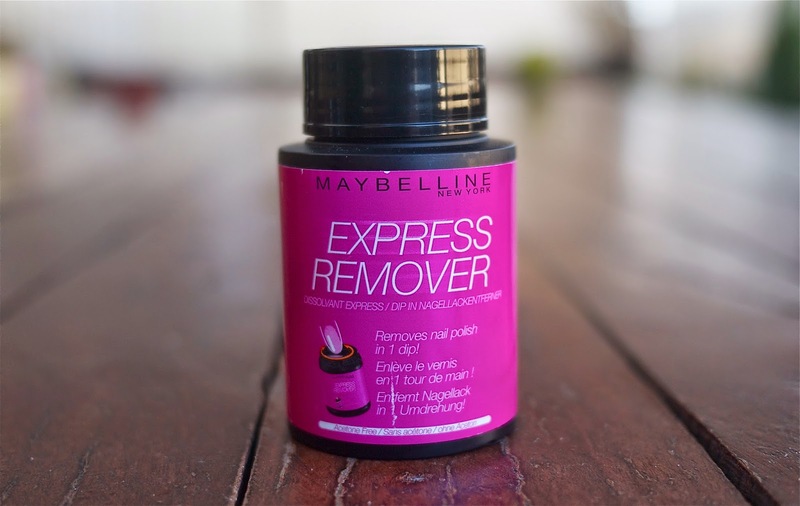 The Maybelline Express Remover is so mess and fuss free. There's no need for cotton pads, or open bottles of nail polish remover. It's all in one place. I've heard that there's quite a lot of fluid in the pot so it can be quite messy if knocked over, but I'm yet to knock it over so I don't plan on seeing if that's correct did I just jinx myself?). The formula is also acetone free which I like, though it may not been your thing if you prefer a remover with acetone. I have found Maybelline's Express Remover to be extremely effective at removing nail polish. To use, I place a finger in the pot, leave for 1-2 seconds and then agitate slightly. For a normal creme or shimmer polish, this is more than enough to remove all polish on the finger. For glitter polish, however, a little more attention needs to be paid. It's still very easy, it just takes a little more time which, if we're honest, is the same regardless of what method you use to remove it. I haven't been using the Maybelline Express Remover long enough to see how long it last for, though I expect it to be quite a while. Given that I go through cotton pads like nobody's business, I also think it might be cheaper for me in the long run. We'll see, won't we? If you like fuss free nail polish remover and this the Maybelline Express Remover is for you, it retails for $9.95 from Priceline stores. I've also seen it on sale a number of times since its Australian release. What's your favourite way to remove nail polish? Do you have a secret for removing glitter polish? Let me know! Wow that's a really good idea and fuss-free. Sounds perfect for someone lazy like me. I'm wondering if the effectiveness will decrease with further use because wouldn't the area where you soak your nail in get more dirty? I've heard really good things about the Bourjois version, this one sounds good too! I probably wouldn't use it for chunky glitters though, I feel like it would shred up the sponge! I have had mine since January from Big W and it is still going strong! I tried once with glitter nail polish and it was a disaster, now I have little chunks of foam that fall out every now and again. Other than that, I absolutely love how I can paint my nails as many times as I want without going through a million bags of cotton wool! I love this but I find it's not as great with glitter polishes... (which makes sense) but still better than the normal way!